The prodigious output of anti-crime legislation since the election of 2001 - more than one bill a month for three-and-a-half years - says something about the man in charge, David Blunkett. A home secretary with a voracious appetite for work, he also pursued a broader agenda than any of his recent predecessors. Terrorism, the structure and accountability of the police, anti-social behaviour, the correctional system, immigration and asylum were all targets for reform. Parts of his programme - such as the immediate response to the September 11 terrorist attacks and his support for identity cards - were driven by events. Parts were dictated by the perceived need to outflank the opposition on law and order toughness. But always evident has been a core belief in the need to reinvigorate local communities and restore a sense of active citizenship which he believes has been lost over the last generation. Mr Blunkett has always been a decisive home secretary, often to the chagrin of his enemies. His immediate predecessor, Jack Straw, would never have acted so swiftly to set up a wholly new correctional structure, the National Offender Management Service, as did Mr Blunkett a year ago when he received the recommendations of a businessman, Patrick Carter. The probation service was dismayed. Senior prison managers left confounded by the speed of action. But there was never a doubt in the home secretary's mind that he was right. Civil libertarians will find the timing of his resignation ironic. From today, evidence of a defendant's previous convictions and other past conduct will be admissible in criminal trials. This and other criminal justice legislation is intended to boost the number of guilty verdicts and restore lost confidence among victims and witnesses. On occasions, Mr Blunkett was brusquely dismissive of criticism from those he called " Hampstead liberals". But politically, he has left the Conservatives virtually no room for manoeuvre. The balance sheet will record that crime has continued to fall under the Blunkett stewardship - though street violence, particularly that fuelled by alcohol, remains a serious concern. It will record that more people are accessing drug treatment - though as a trigger for crime addiction is still a significant factor. It will show that the number of asylum seekers has been reduced - but that the system for returning failed applicants is still creaking. It will show that the courts are issuing more Anti-Social Behaviour Orders - but the public still regards low-level youth crime as out of control. And it will record that Britain's security is probably more robust and coherent than it was pre-9/11 - but at a considerable cost to human rights. 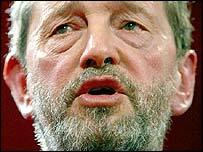 It is a legacy which Mr Blunkett will be happy to take before his electorate in Sheffield should he stand again. But many others will say he could have achieved as much without being as abrasive or as intolerant of his critics.